Chileno Bay Resort & Residences brings a modern luxury experience to Los Cabos, Mexico. Chileno Bay Resort & Residences brings a modern luxury experience to Los Cabos, Mexico. 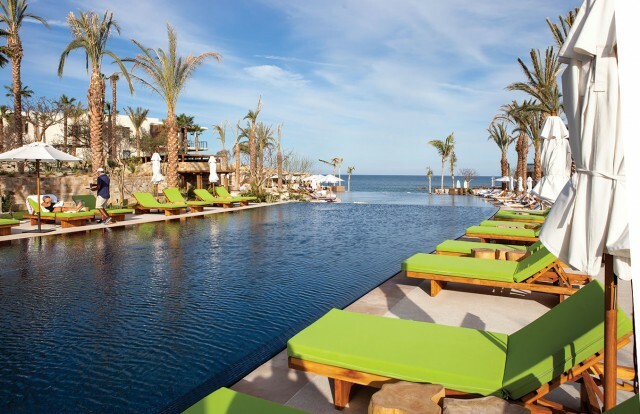 Set on a protected cove, the resort stands apart for its contemporary design and premier location on what many refer to as the best beach in Cabo. The property is anchored by its spectacular zero-edge, three-tiered pool, which developers and owners Mark Cooley and Edward Hooten of SV-RED Management say was designed to be bold and a centerpiece of the resort. The upper section of the pool near the wellness building is family-friendly; the middle and lower oceanfront tiers have cabanas for day use with curtained privacy. Fire features and chaise lounges throughout add ambiance and ample space for relaxing. The oceanfront pool has a large Jacuzzi nestled into the corner and a spectacular ipe wood deck leading to the adjacent bar and beachfront activities. All three pools are finished in iridescent blue tiles by Oceanside Glasstile that reflect the water of the nearby Sea of Cortez.